5.00 a.m.: I’m an early riser by nature but I don’t normally wake at 5am (unless the kids have me up! ), but its June 24th, the day of the UK referendum results. When I went to bed last night the GBP/USD was touching 1.50, hitting its highest point in 2016. The market is convinced, as are most people looking on, that Remain will carry the day. During the run up to the Referendum this currency pair was a barometer of the ebbs and flows of the Polls and to a larger extent the markets view on Brexit. I turn on my phone and check the Bloomberg headlines: ‘UK pound collapses to lowest since 1985 on Brexit shock’; ‘UK Votes to leave EU, BBC projects’ All the headlines that I didn’t expect to see and GBP/USD at 1.32! In just a matter of a few hours the currency pair was at its lowest point in 31 years and its biggest ever daily swing. The fallout from Brexit will set the tone for today and the foreseeable future. David Foley: 'The fallout from Brexit will set the tone for today and the foreseeable future'. 5.45 a.m.: I’m at my desk and as expected the air of surprise and confusion abound as the market is trying to digest the event. When I look at my screens, not surprisingly all asset classes are showing large and volatile moves. Trying to estimate or get a sense of where the Interest rate market, particularly GBP, will open up is near impossible. I talk to our various Money Brokers to get their feedback on where the GBP futures will potentially be, of course the views vary, so it’s really just a matter of waiting for the market to open. There is constant commentary coming down the line from the market analysts expressing their views on Brexit, trying to get to grips with what is unfolding and forecasting the political fallout from the events overnight. 7.30a.m. : Most of the Treasury team are in at this stage, I’ll let them absorb the overnight news and the current market landscape before we come together to discuss. I organise a team meeting after they review their client portfolios and analyse their interest rate books and bond portfolio impacts. They absorb as much up to date information and commentary on Brexit from our internal and external sources to get a broader picture that will help to make more informed decisions and opinions. The top line with the Brokers is kept open - a constant feed of prices / reactions / repricing from the various markets. When working in a Front Office role there is a consistent flow of incoming information, it’s a matter of filtering what’s relevant at a particular time. As is normal, we constantly analyse our Books and positions and closely monitor liquidity flows. On top of our own local contingency planning, Group Treasury would also have been preparing for potential consequences of a Brexit fallout. Clients will be calling shortly looking for live prices and to discuss the general impact of Brexit on financial markets and the broader economy. I have a discussion with my Sales team about pricing and client feedback and I also meet with the Interest rate risk team to consider the current state of play in the market. Throughout the course of the day there is constant dialogue and information flow between the whole team. I have regular meetings with our Sales and our Interest rate risk teams. These meetings can be very specific and concentrate on a particular topic or the meetings can be broad, depending on what’s happening in the client or market space. I generally have separate meetings with the Sales and the Interest Rate teams. They are integrated under Treasury but some topics, eg Gapping risk wouldn’t necessarily apply to the Sales team. 10.30 a.m.: Our UK-based Research and Strategy team organises a Post Brexit conference call for all our clients and for BNPP Markets personnel. Today’s call will cover everything from Equities to FX, so there is something in there for everybody. The analysts present their views on the market and the economic outlook following the vote. A long Q&A session ensues as participants try and make sense of what Brexit means for their activity. 11.30 a.m.: I’ve been receiving prompts all morning of upcoming meetings previously booked into my diary. Today was supposed to be BAU (business as usual)! There’s not much chance I’ll get to all of today’s meetings but there is one or two I’d like to keep as it’s hard to co-ordinate calendars at this time of year. I always find mornings to be the busy period in the Dealing Room. Most people who work in Front Office are at their desk early and therefore the market tends to be busy, orders are executed and client calls are made. The afternoons can be taken up with addressing issues from the morning’s business, catching up on administration, internal meetings and client meetings. 12.30 p.m.: I spend the next hour taking feedback from the Team on client flows, liquidity, rates and any issues that might need more attention. BNPP London is the hub for GBP liquidity and because of the market impact from Brexit today, we will have more contact than we normally do with this team. 1.30p.m. : I always try and get off the desk for 30 minutes, if anything just to clear my head and grab a sandwich. Sometimes I might be asked to present at our Induction day for new recruits, this might be held during lunch times and it’s a good opportunity to meet them. 2.00 p.m.: I take a call from our European Head of Corporates deposits. 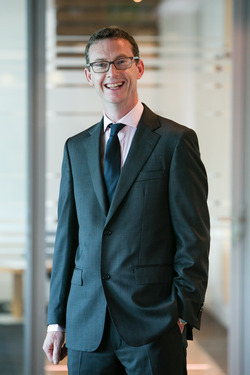 I have regular contact with him as Treasury Dublin provide pricing to his UK-based teams. Todays call is about the impact of Brexit on client activity: we discuss his liquidity forecasting and interest rate developments. A member of his team visits Ireland a number of times during the year giving an opportunity to have a more in-depth conversation about their client portfolio, currency mix, tenor and from my side, to explain what our current and forecasted funding needs will be. 2.30p.m. : I follow up on a topic that we discussed at a recent EXCO meeting. I have a scheduled call with Group Compliance concerning clarification on an internal policy matter. I want Compliance guidance on where we stand and if any remediation is required on my side. I have frequent interaction with our local Compliance Dept but also with Group Compliance because of our international footprint. Compliance meetings generally take the form of explanations about new Policies and Procedures that need to be adapted or changed locally. 3.30p.m. : Even considering today’s events, the show goes on and my calendar alerts me to a meeting with our COO. Within Treasury we manage Risk, Fund business lines, market a client portfolio, address compliance and banking law requirements and manage a balance sheet. This level of activity requires us to frequently interact with numerous Departments within the Bank and we are also heavy users of the IT platform. Today’s meeting with the COO is specifically about IT and Operations. The Treasury business has been expanding year on year and hence our IT and Operations requirements need to be reviewed. 4.30 p.m.: Within the Dublin Treasury we have a Commercial Paper (CP) program that is marketed to US based Money Managers. The marketing of this product is performed by our US Sales team and we have daily interaction with these guys. They give us feedback from the street and where the market is paying for certain tenors, it’s an opportunity to adjust our pricing according to our needs. This team is based in New York, so the information we receive about the USD market is always timely. Obviously today’s dialogue is all about Brexit, as expected their clients need time to assess the impact before making any long term investment decisions. 5.00 p.m.: Another Conf Call has been arranged with our Research and Strategy guys. It is the same format as this morning’s call except we have our US Research people also joining and contributing their views from a US economic perspective. 5.30 p.m.: I have a call with the Deputy Head of Treasury Markets for Western Europe and North America. This is normally a weekly call. The discussion is wide ranging but predominantly it’s about the Treasury business, current projects that we are working on, budget forecasts etc. We are trying to put a date in the diary that works for both of us to visit the Treasury team in New York. I try and get over there at least once a year. Visiting the NY team builds a better overall relationship. 7.00 p.m.: I try and make it home before the kids go to bed, their day always sounds more interesting than mine! I try and switch the email off but sometimes there are particular events happening that I need to keep in touch with, today being a fine example!